Among some other Baaj Sur fishing holes, I'm headed to Mag Bay for...hopefully!...some fine fishing in the mangroves. 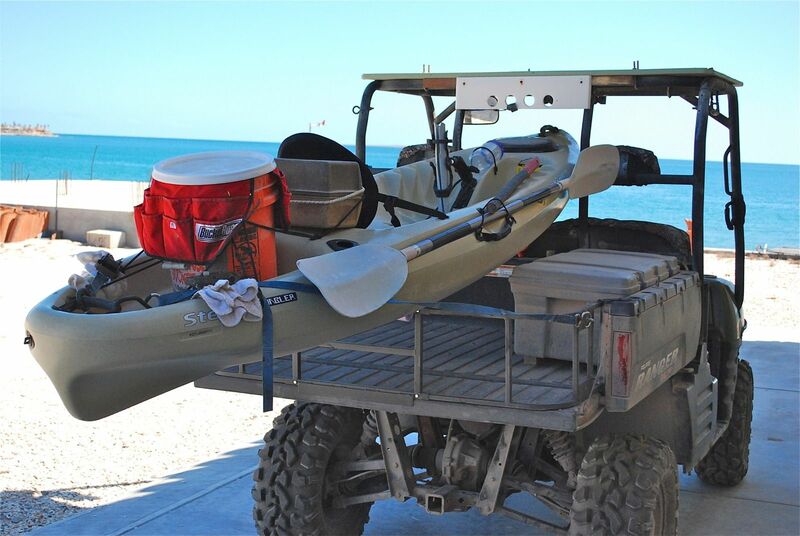 I'm taking my fishing boat, naturally, but want to try some kayak-fishing, too. THE PLAN: I silently sneak under the overhangs and cast to the wiley snook. Anybody want to part with yours? Let me know your price and location.. ASAP. I'm in the market for 1 or 2. Co-pilots are kayakers, too, y'know. Singles or doubles are okay. Need to be in good to excellent condition. Would need paddle/s, back rest, etc. Set up for fishing is a plus. If yours is...Pink..forget it. Also looking for a 2-kayak roof rack..or more...complete and road ready. Many thanks and Tight Lines! .... If yours is...Pink..forget it. Uh, since when did you stop slipping into something pink? December through March seems to best craigslist shopping for kayaks. This Ocean Prowler might be better for fishing. bajadock...Wow... just made an appointment with the gal selling that brightly-colored kayak at 4 pm today, and it's RED, not pink. Incidentely, she's moving to Korea...to teach school. Brava for her. motoged...I have no clue as to what you are talking about..other than maybe my interest in certain pink lures. My favorite Mirrolure & feather color. Those Hobies with the pedal-drive are, by far, the best kayaks for fishing. You have both hands free. Pompano, hope it works out. Only thing I am missing in my fleet of 4 kayaks is 1 more wide body. My 2 Scupper Pros are a bit skinny for lard-a$$ guests. The two Prowlers listed in today's SD craiglist are good buys, but I'm only in "want" mode, not need. Best of luck in Magdalena...I hope they are biting. I have a 2-person kayak that's in decent shape; didn't realize that you're up here in CA. I'm in southern Orange County, if you're interested. I'd sell it for $250 w/backrests (new) and paddles. I am interested, gallesram... but just how far north of Chula Vista? I'm swamped with clinic visits right now. Maybe email me some pics. U2U here and we can yak about kayaks. Thanks. Hey! our doubler is PINK! Doesn't bother me as if theres ever a problem being on the water, it will be seen from a mile away or up by those who might be looking for us! Never understood why those greens or blues are so attractive...never seen a rescue raft that wasn't some shade of PINK and that includes Red! Comon Pompano...if your ever clutching your heart in a kayak...you'll want to be found, quickly. And in a pink kayak you don't have to worry about someone shooting you while hunting! Hell...I'm agreeing all the way! Why do you suppose my best lures are PINK? Not to mention other pink things. I would enclose a photo, but ...for once.. I'm censoring myself. That fits some styles I've been looking at up here, Russ. Sweet boats and no carrier needed for the pickup box..just a padded holder. It's like lures, though...so many choices, so little time. The Hobie is the chit according to my Kayak fishing friend. I who know very little about Kayaks went out fishing on one of his Hobies and it is pretty impressive to this novice, trolling with both hands available. I would strongly consider one. He bought a conventional then turned around and bought the Hobie. Understand. Saw a couple of what looked like pedal units in the photos and thought they were in contention. You're not alone, many aren't comfortable pedaling in a recumbent position. The part missing from this discussion so far is the bits about beam, draught (draft for you south of the 49th ), rudder, and quality of watertight seals/covers. For speed you will want a longer sleeker hull with little drag ....and for fishing a wide beam with some strakes for stability ...it would likely be much more of a utilitarian vessel than a sporty convertable. Whatever you get, it will likely be rotomolded plastic. Don't cinch it down tight on roof racks or you will deform the hull (same reason not to sit on it on dry land for any period of time)...you can often bring a deformed hull back to pretty good shape by laying it in the sun hull upwards and covered in black plastic garbage bags or something to act as a solar heat collector....hence warming the hull and letting the plastic's memory work. Scratches on hull from dragging it on sand or rocks can be smoothed out with a warm iron...as they create significant drag if left if they build up. Excellent points, motoged...and gracias for bringing them up. For certain weather & special places...like calm days along Mag Bay mangroves for robalo...or weedy bays Up North for waldos, bass, pike and muskie. Shopping for a boat is like nothing else on earth...right? Another big beast is the Cobra Fish & Dive. Good luck, boat shopping is great fun!